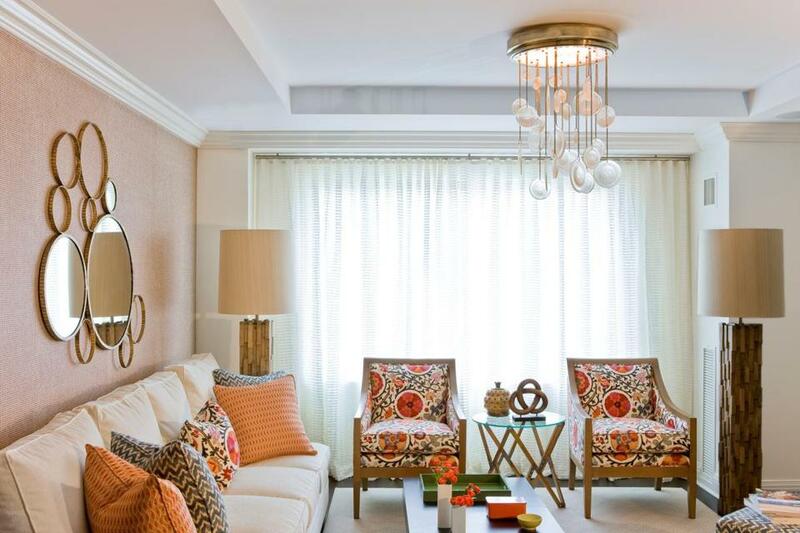 These seats fromDuralee are clad in a Brunschwig & Fils fabric that mimics the circles in the chandelier. “The circle motif creates a rhythm, which makes it feel calm and cohesive,” Donohue said, noting the circular patinaed-brass mirrors and glass tabletop. With its bright grasscloth-like texture this wallpaper, “Bellport” from Cowtan & Tout, brings “more depth and more dimension to a small space,” Donohue said. That the color is reflected in the chair and throw pillow fabric only adds to the cohesiveness. Eileen McEleney Woods is the editor of Address. E-mail her at eileen.woods@globe.com.